Side note before we get started: we know not every team's season may align with the months we have outlined in the guide. Feel free to adjust the months for your team's season and timeline! COLLECT all uniforms and accessories. ASSESS OVERALL INVENTORY STATUS. Will you need replacement, repair or new design for these items? t-shirts, warm-ups, etc., so they are available whenever needed. Check out our Sizing and Measuring page for some additional tips, including a How To Measure Your Team video tutorial! DETERMINE IF YOU WILL BE PURCHASING NEW APPAREL and establish budget. When and how much to fundraise? Identify potential suppliers and early booking discount opportunities. TAKE ADVANTAGE OF EARLY BOOKING DISCOUNTS if you know the theme for your competition season performance. Many companies offer discounts to start early with the design process - even if you aren’t ready to confirm your quantities or sizes yet! Read our blog post: The Easiest Way to Save on Your Custom Costume for more early dance costume planning tips! to make sure you receive them in time for your team’s first appearance or performance. Average lead time can be 4-12 weeks. START DESIGNING AND PLANNING your competition costume. For help with design and and inspiration for your next costume, check out The Imagination Kit: A Costume Planner. REORDER UNIFORMS AND COSTUMES if you are reusing your team apparel from last year and need additional pieces. For more details, here are 6 Tips for Making Dance Costume Reorders a Breeze. PLACE A DEPOSIT on your competition costumes now to have them in time for the competition season. Consider a 16 week lead time for any costume, custom or catalog. CONFIRM YOUR COSTUME DESIGN and arrange for a sample costume. This is essential if you are working on a custom costume design. PASS OUT GAME DAY, CAMP, AND TEAM APPAREL UNIFORMS. Document who gets which piece. For easier tracking, number each item on the inside tag. CONFIRM YOUR QUANTITY AND SIZES to finalize your order for competition costumes. APPROVE YOUR SAMPLE COSTUME so it is ready for production. MAKE FINAL PAYMENTS to confirm your in-hand date for your costumes and apparel! HAVE EACH TEAM MEMBER TRY-ON THEIR COSTUMES, once received. Be sure to have them rehearse and move around in their costumes to make sure everything stays in place and looks its best! GO OVER GARMENT CARE WITH YOUR TEAM. Identify 1 person to be the Garment Care Team Leader - a coach, parent or team member. We recommend having one person do this so the washing is done correctly and consistently! Check out The Do's and Don'ts of Dance Costume Care for more recommended guidelines. WATCH WASHING VIDEO WITH YOUR TEAM for a great visual and step-by step tutorial. IF COSTUMES ARE NOT RHINESTONED OR EMBELLISHED, get the team together to add the perfect finishing touch! Check out our blog posts on How to Rhinestone a Costume using the Hotfix and Flat Back methods. CONFIRM ACCESSORIES that may be needed to finish your look and purchase. Jewelry, hair pieces or hats, tights, shoes, gloves, mitts, etc. ASSESS HOW YOUR COSTUMES ARE PERFORMING after your first few competitions. Look at the judges’ evaluations - do you need to make any changes or switch out some accessories? 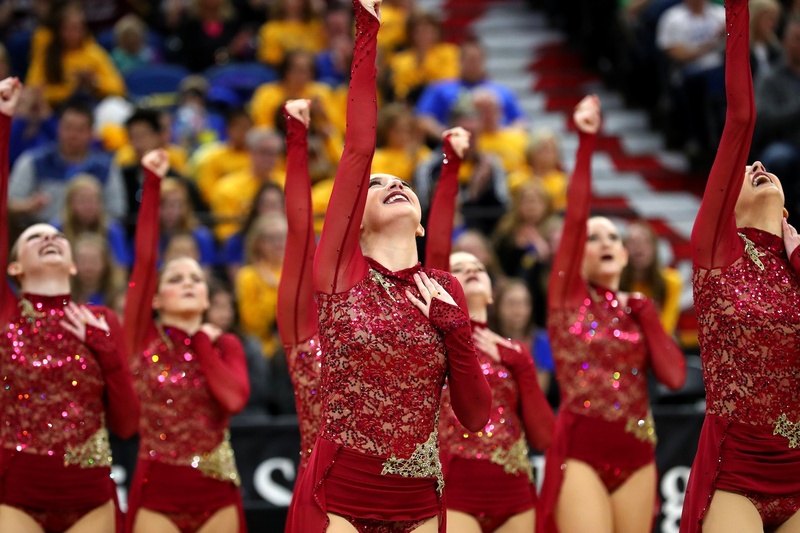 IF YOUR TEAM IS COMPETING AT A HIGHER LEVEL COMPETITION, such as State or Nationals, consider ordering fan apparel or more team gear to have in time for those competitions! ORDER APPAREL FOR YOUR ALUMNI! CLEAN THOSE COSTUMES! After competition season has come to a close, make sure to clean your costumes to enhance their longevity. WATCH THE WASHING VIDEO ONE MORE TIME to ensure everyone knows how to properly launder their garments!